Before starting the recipe for this, first let me give the brief description about adai for those who are not familiar with this word. 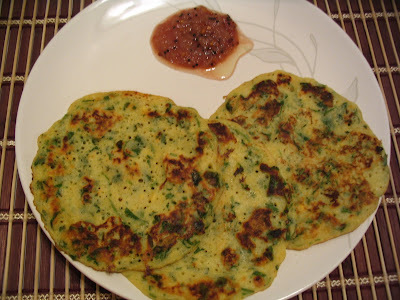 Adai is mainly a south Indian dish. It is prepared with the combination of dhal and rice which is soaked in water and ground as a batter with mild spices and made like pancakes. It can be served with chutneys, Pickles, Sambar and Avial. There are different types of adai with different combination and proportion of various kinds of dhal and spices. They taste excellent and healthy too. I will be posting one by one soon. Moong is a splited green gram which is yellow when de-husked. Moong is the main ingredient of this Moon dhal adai. This is so healthy because of high protein content and also tastes yummy and stomach filling dish. I have served with Onion chutney (ulli karam). This is so easy to make too. So try it out and drop your comments. 1. Wash dhal and rice separately and soak it in water for 2 hrs. 2. Grind them, not too coarsely and not too fine. 3. Mix both dhal and rice, add salt and chopped coriander. 4. In a hot skillet pour one ladle full of batter and spread like a pancake or thick crepes. 5. Put tsp of oil and turn to other side. It should be done until you get crisp on the edges. 6. 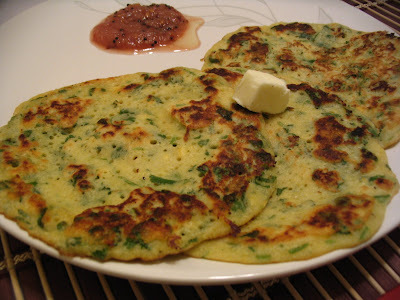 Serve with tsp of ghee or butter on top with spicy onion chutney or garlic chutney. 2. Season with mustard, urad dhal, Curry leaves in sesame oil. As this chutney has raw onion adjust the tamarind, jaggery and chillies according to required level. the onion chutney sounds delicious too ! Love your blog! Would you mind changing the font color for this recipe please. I'm having a hard time reading the yellow. Thanks!